We have just received information that the Intel Skylake CPU will not feature PCI-E 4.0 after all, it will continue to use PCI-E 3 but will thankfully feature DDR4 Capability. Undoubtedly all of you will be aware but to those who arent Skylake will succeed Broadwell. There had been countless leaks in the past that all but confirmed that Skylake will feature PCI-E 4 but it turns out that Skylake wont feature PCI-E 4.0 After all. Unless Intel takes a few pointers out of Microsoft’s books decides to change its mind again of course, at which point we will let you know. For the time being this information seems to be set in stone. The leak source is the highly reliable Chinese VR Zone. Skylake is set to appear in the Greenlow platform and surprisingly will be using the LGA 1151 platform for its Xeon lineup. 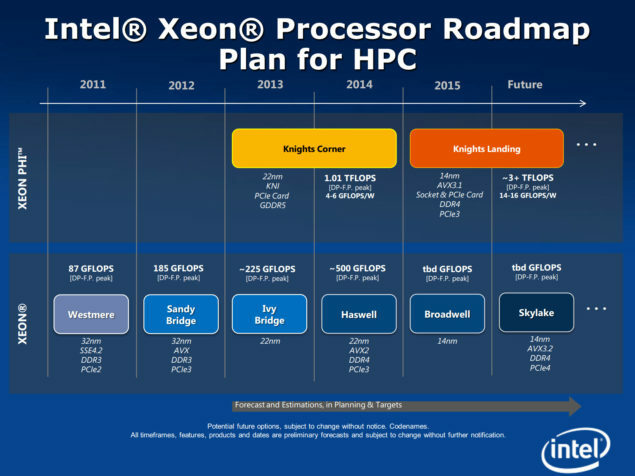 The first Skylake Xeon Processor will be the ‘E3-1200’ Model. It will have 4 DIMM slots that will be capable of supporting [Typo Fixed] 64 GB DDR4-2400Mhz RAM. We are slightly skeptical at this because the Xeon lineup is meant for Industry use and while we might not need more than 16 GB of RAM try doing Intensive Rendering and see how quickly your 64 GB go. A 128 GB DDR4 limit would have gone quite snugly. Enough nitpicking and we continue ahead. We can’t say whether it will utilize the AVX 3.2 Instruction set or not. According to the same source, the Greenlow platform should have the Sunrise Point PCH containing the Intel C230 Series chipset. It will support upto 20 lanes of PCI-E 3.0 and will have 8 Sata 6GB/S and 3 SATA Express ports.It will use Jacksonville Phy meaning it will support the I219LM Intel Ethernet controller. Skylake is set to launch in 2015.